I’m getting used to this photo a day of myself. I’ve never been that comfortable with photos of myself and I hoped that documenting Frocktober would alleviate some of that. I think it has. I’m learning which poses I like better as a photograph of me. You’ll note there’s more than 14 photos below. That’s because on some days I wore more than one frock. So far I’ve managed not to wear one twice. Thanks to my son for taking most of the photos. He’s mostly doing it now without complaining. And I’ve nearly reached my target of $700 to raise money for ovarian cancer research. 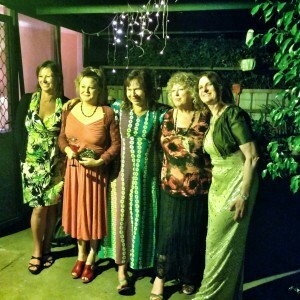 See my Frocktober donation page if you would like the stories behind the dresses and/or to donate. 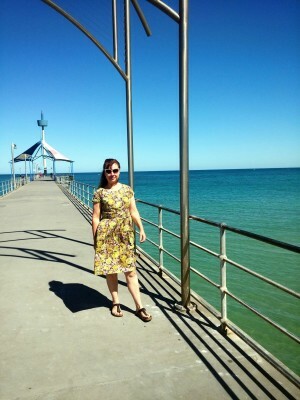 I’ve been doing a count of where the frocks come from – new or op-shop. Op-shop is so far a clear winner. See my frocks in week 1. Seeing as it’s Wednesday I’ll join in on Trish’s Wordless Wednesday. Frocktober Day 14 (my birthday). Am posing with a couple of colleagues who frocked up. Frocktober Day 18 (evening). 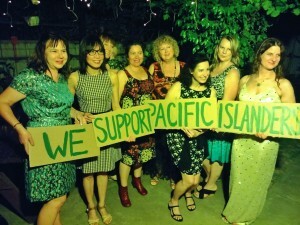 Posing with some friends holding signs in support of Pacific Islanders. 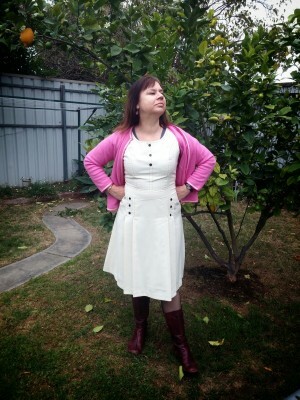 Frocktober Day 18 (evening frock 2). Why not? Very impressive. Love the array of frocks. I only own 2 and neither fits me! Happy belated birthday by the way! Which one on day 11? There was the day frock and the night-time (disco) frock. 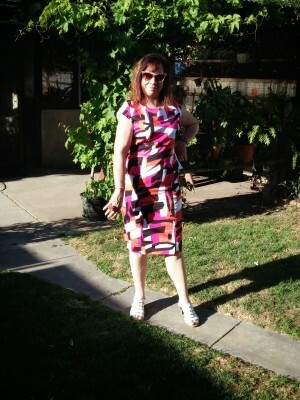 I have a bloggy friend who is also doing this and I am AWE of you both – I only own 2 dresses that actually fit properly! I’m impressed you haven’t doubled up yet! I’m personally quite partial to the dress you wore on Day 21 – good luck for the rest of the challenge! so many frocks! I think I own a total of 4. I would have to do some serious re-wearing to participate in frocktober. Maybe I should just go shopping. MORE FROCKS! Yes, absolutely. More frocks! If you get time inbetween having a baby and all. Well done JJ , your look great in those frocks Jen – I am amazed they came from Op shops. I only own about 4 frocks too – like Toushka.